Was I ready for a Big Dog? An amazing person telling the world how rewarding it is to own a large dog in a big city! The decision was made. I was adopting a dog. Not just any dog. A Cane Corso. A mastiff. One of the biggest breeds of dogs around. I had sold myself as an experienced big dog handler. I needed to be exactly that. I went about preparing my home and buying everything that I needed to be a responsible big dog owner. The Toronto Humane Society (THS) had suggested that Blaze would need a crate and a martingale collar to best control his size. I had these items and I felt good. I was ready. A North of Bloor reader recently asked me where I lived. When I responded that I lived a few houses south of Annette Street, near Keele I was criticized for not actually living in the Junction, despite writing as if I do for the purpose of this blog. As someone growing increasingly attached to the area, this was devastating—if not entirely accurate. First and foremost, while the Junction is often described as the area North of Annette, South of St. Clair, and East of Runnymede to just West of Keele St., the boundaries of the former City of West Toronto, stretch all the way South to Bloor St.
After I defended my claim as a resident of the Junction, I realized that location isn’t what it used to be. Even if you don’t accept that someone living South of Annette Street is a Junction resident why does it matter? I spend most weekends in the area, do all my grocery shopping on Dundas as well as attend Junction community events. My partner and I frequent area pubs and cafes, and my favorite bikeshop is, of course, The Bike Place on Dundas St.
Now, for all intents and purposes, Monday through Friday from 8:30 am well into the evening, I spend most of my time in the Discover District, where College and University meet Queen’s Park Cres. This is where I work, cycle, shop and visit pubs and cafes. Traffic congestions, new infrastructure developments and festivals in this area impact my life just as much as if they were to happen in the Junction. To take this even further, I grew up in the west end of Sault Ste. Marie and lived in Ottawa for several years—I still feel very connected to both cities. While ultimately you can only vote in one electoral district, claim a permeant place of residence for you taxes and have one primary “home,” mailing address; only you can define your community. Don’t let these situations or the opinions of others define it for you. Wherever you call home, remember to get involved! Spring is in the air in the Junction and it’s hard not to be excited. After living in the area for over eight months, I’ve been waiting with great anticipation to see what would become come of the Campell Block. Located on the busy corner of Keele and Dundas Street West, this glories building is currently buried under scaffolding and caution tape. Built in 1888, the Cambell Block served as an area hotel in the heart of the Village of West Toronto Junction, before the neighbourhood was incorporated as the City of West Toronto in 1908 only to amalgamate with the City of Toronto in 1909. Last week, I happened to glance at a poster that, at long last, explained what would become of this west end landmark. The building is being converted into loft-style apartment buildings with commercial space on the first floor. There is nothing exciting about yet another loft in Toronto—unless it’s in the Junction. Rather than tear down this basilica of the neighbourhood, the developers carefully restored the Cambell Block to its original glory, while modernizing the interior. The respect paid to the buildings heritage is admirable. This preservation technique can also be seen at 152 Annette Street, where a church was converted into beautiful (though very high end) housing units and one breathtaking penthouse. I’m of the mind that controlled development can be a good thing for a neighbourhood, so long as it doesn’t undermine the fabric of the community. Working new housing projects into old buildings is a time-tested way to pay homage to area landmarks while acknowledging the realities facing commercial and residential space in downtown Toronto. 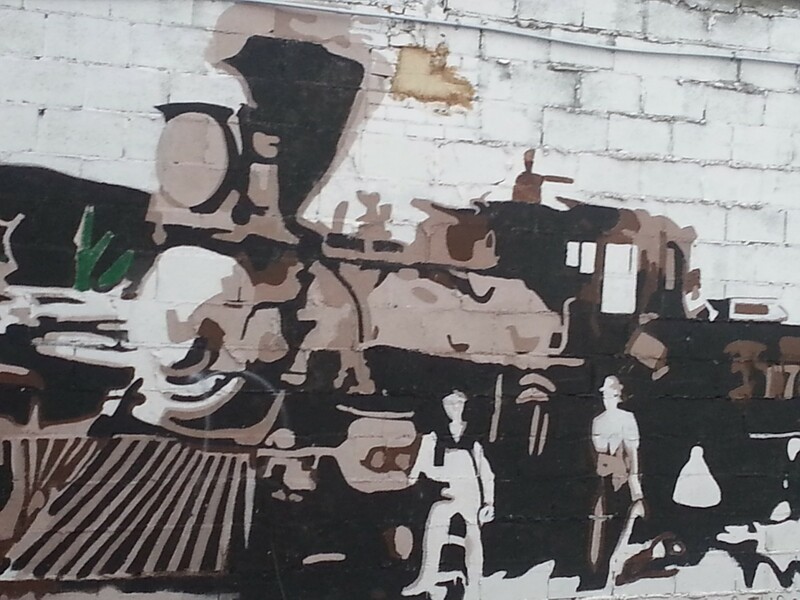 Throughout this blog, I’ve taken every opportunity to integrate local murals that correspond with the topic of the post. This method is a testament to the variety of murals in the Junction and their ability to represent key elements of the neighbourhood. Many of these murals were planned and commissioned, be it by not for profits in an effort to promote street art or the City of Toronto itself. Regardless of how we end up sharing the neighbourhood with murals, each has its own unique story and community identity. Take the mural at the underpass on Dupont street, featured here. The mural features cyclists and the Toronto Cyclists Union’s Motto “strength in numbers,” which is fitting to mark the northwestern starting point of the west Toronto rail path. The project was commissioned by the Graffiti Transportation Investment Program and the Toronto and Ontario Arts Councils and the artwork was completed by Art Starts. The latest addition to the street scape in the area is a stone throw from Bloor street at Keele station. The mural was created by area artists Tommy and Rob Mateka through StreetARTorono (StART), which attempts to promote and legitimize street art in Toronto. The subtle shades of reds and yellows depict a row of houses not unlike those nearby in the High Park North area. The calming facade makes for a nice contrast to the busy transit hub across the street. These murals and so many others in the area contribute to building a vibrant neighbourhood. They connect with their surroundings and challenge pedestrians to view their community in only the most positive way. The brilliance of the StART program is to develop murals in areas that experience repeated graffiti, as a way to legitimize street art and reclaim public space. A walking tour of street murals is a great way to refresh your perspective of the area you live in and view your neighbourhood the way others see it. As we transition from Winter to Spring, my attention turns to focus on one thing—when will my local farmers market open! Food is a defining feature of a neighbourhood. I would argue that it has always been this way but in the past few decades there has been a proliferation of academic work and community activism focused on access to food at the neighborhood level—often referred to as community food security. In this area, Toronto’s Junction neighbourhood delivers handsomely. The Junction Farmers market debuted in 2012 and runs every Saturday from late May to early November each year. It touts an impressive number of local vendors including Bizjak farms, Fiddlehead Farm as well as featuring an Ontario wine each Saturday. I’m most impressed by the markets continued focus on food. While baked and material goods add depth and an interested dynamic to a market, I believe it’s important for the key function to remain providing access to nutritious, locally produced food. The organizers of the market are keenly sensitive to importance of providing equitable access to healthy food and run a food voucher program at the market. Recipients of these vouchers enjoy increased purchasing power at the market and are chosen through their participation in a local nutrition program. The vouchers are funded in part, by an annual night market. The land used for the market is also offers free public space all year round for musicians or coffee sippers such as myself. The Junction farmers market truly supports the community in all sense of the word. Ever wonder how to build the neighbourhood you desire? In previous posts we discussed the impact of community initiatives like the petition campaign in the Junction or the naming campaign in the Junction Triangle. These are not one off instances. Everyday, neighbourhood change makers develop new and creative ways to enact positive change in their community. Make your issue known: It may seem obvious, but raising the issue with the local authority, be it an elected or appointed official, a business or a property owner helps put the issue on the radar of the appropriate person or organization. It may seem obvious, but write them a letter. Be sure to date your correspondence so you have a reference point in the future. Strength in Numbers: In the time between drafting your letter and receiving a response, start organizing. Petition drives are a great way to demonstrate home many people are invested in your cause. Online campaigns like change.org are a great way to garner a large number of supporters in a short period of time but often don’t require an official response. The House of Commons recently changed the rules to allow online petitions to be submitted but the Legislative Assembly of Ontario, as well as many municipalities still require original signatures on a petition. Going door to door with a petition at the neighbourhood level is one of the best ways to show the popularity of the issue in your own community. Flex your muscle: Once you have organized your petition drive, plan an event. Line up stakeholders that will be positively or negatively impacted. You only need a few stakeholders to speak out–the others will be reflected in the number of signatories on your petition. Invite neighbours, press and any other interested parties to this event and be creative with the visual of where and when it takes place. Try developing a social media strategy to augment your event. It’s a great way for people to participate that cannot make it in person, and is also another way to demonstrate the number of supporters. Try organizing a Thunderclap! Read, React, Respond: Be sure to adapt to changing situations. You may find your perspective on the issue has changed since you started–Embrace this and move forward. On most weekends, if I’m found five blocks away from my apartment on Keele St. I’m at the outer limits of my catchment area, so it’s not often that I feel confident to post about a neighbouring community. But, I’m finding myself more and more drawn to an area known as the Junction Triangle, immediately to the east of the Junction and spanning much further to the South. A short stroll along Dupont St. from Annette to Lansdowne Ave. showcases the unique post-industrial vibe of the area, with its ever growing selection of new restaurants and cafes, as well as a local library and easy access to the West Toronto Railpath. Today, most West Toronto residents worth their salt will recognize this area as the Junction Triangle, but this wasn’t always the case and the success of the name is a testament to a creative, community driven naming campaign. In 2009, residents and business in the area were involved in a year long naming process in search of the official name for their neighbourhood. A community group called “Fuzzy Boundaries,” initiated the campaign and moderated community meetings before the final decision was made in March 2010 over 200 names were submitted. Many of the names were showcased in chalk writing along the West Toronto Railpath, in a rather creative exercise in community engagement. The anniversary of the official naming of the neighbourhood is celebrated to this day, and since then many other notable issue based, community driven campaigns have delivered results for this area. In an area where residents are quick to point out that their community is distinct from their neighbours to the west of the tracks, it’s fitting that I find myself walking east to the triangle when I’m looking for something different. Every Monday, my alarm clock flashes 6:15 am and I wake to the bustling chatter of CBC’s Metro Morning. I reach for my phone, scroll through my twitter feed and start my day. By 7:15 I step out my door and weather and workload permitting, I unlock my bicycle and begin one of Toronto’s most pleasant commutes. I race down Annette St. towards Dupont and finally reach the staging area for the 2.1km West Toronto Railpath (WTR). As I embark on a traffic free ride east from the Junction to college street, I’m passed by airport commuters on the UP Express headed west and GO train patrons headed east on the rail lines that run parallel to my cycling highway–each of us enjoying a car-free morning in our own right. With its unmatched convenience and integration into its surroundings, it’s easy to take the WTR for granted. Make no mistake, the development of cycling infrastructure rests on dedicated community activists and forward thinking city councillors and the WTR illustrates that West Toronto lacks in neither category. While the Southwest neighbourhoods of inner city Toronto are serviced by the Martin Goodman Trail that runs alongside the Lakeshore in an East-West Orientation, residents North of Bloor longed for similar ease of access to the downtown. West Toronto residents with an interest in cycling infrastructure banded together. While residents, politicians and advocates discussed the possibility of a multi-use path along former railway for some time prior to the opening of the WTR, notable organizations involved include the Roncesvalles Macdonell Residents’ Association, Community Bicycle Network and Evergreen . Thanks to the dedication of these community advocates, Junction commuting became much easier. With plans to expand to a total length of 6.5 km and connect west Toronto to the downtown core, we owe a lot to the hard work and dedication of our neighbourhood leaders. If you’ve ever uttered the words above then this post is for you. Recently, I experienced an intense case of buyer’s remorse when I discovered my local pet shop was closing. I was in the habit of buying pet supplies from an establishment downtown, closer to my office but I’d always meant to transition to my neighbourhood store. Having worked on community food issues in the past, I know all too well the importance of supporting our local businesses. While policies at the national, provincial and municipal levels of government help create a framework for local industries and business to thrive, the choices we make everyday also have a significant impact. Local businesses embody the history of the area, participate in events and festivals and help define what others think of our neighbourhood. I think residents in a position to take advantage of what they have to offer have an obligation to do so. In my opinion, the Junction benefits from a wonderful selection of restaurants, fitness facilities, grocery stores, retail spaces as well as all the services that make this area one of the most livable in Toronto. Every dollar you spend in your neighbourhood helps define what it will become. A consistently crowded neighbourhood café helps demonstrate that a community can support additional coffee options. Local patrons drive future options. Here are a few helpful tips to leverage your purchasing power to build your neighbourhood. Know your neighbourhood and be able to make recommendations on where to eat, play etc. If your area boasts a number of businesses offering the same product, don’t pick a favourite. Rather, rotate your business among several that you enjoy. Use social media to show off your neighbourhood. Try tweeting about the beer selection at a local restaurant or post about a meal you enjoyed. Is something missing? Let me know what criteria you would include to help people shop local. The power of a petition! Last month, it was reported that the greater Junction Triangle may one day become Toronto’s newest brewery district. Rightfully so, as the Junction triangle, and especially my area to the western edge known simply as the Junction, contains a plethora of craft breweries and restaurants serving tasty pints of the local standard. It’s hard to believe that an up and coming brewery district spent the majority of its lifespan as a dry neighbourhood. The prohibition of alcohol sales in the Junction began in 1903, after area residents responded to a series of issues resulting from public drunkenness. At the time, the area was actually known as the village of West Toronto Junction before its incorporation as the City of West Toronto and finally its eventual amalgamation into the City of Toronto in 1909. From 1903 until as late as 2000, the sale of alcohol was prohibited in sections of the area along Dundas from Keele to Humberside. To end the local option of prohibition, area residents needed to gather 6 000 signatures in order to put the question of removing the neighborhood dry designation to a referendum. While several attempts to allow for alcohol to be served in the Junction were made throughout the years, it wasn’t until a 1997-98 referendum that some areas were allowed start serving alcohol before the ban was completely lifted in 2000. The petition and eventual referendum was the result of the tireless efforts of local businesses and area residents. Today, Chapter 27 of the Toronto Municipal Code governs the preparation and presentation of public petitions to Toronto City Council. In general, a public petition must contain the name of address of at least one, but ideally all signatories, an explanation of the issue and petitioners’ position as well as the contact information for the organizer. This example of the petition and referendum campaign to allow alcohol sales demonstrates the power of a petition campaign to change a defining element of a neighbourhood.Overall, successful petition campaigns show a consensus of neighbours united on an issue, are great community building exercises and can help foster positive change in your community!